Come hear the sounds of spring! The long winter has meant hibernation for many of us, but the frogs are now singing that it is time to come outside and play! At Mountsberg Conservation Area, male frogs will soon be getting ready to sing in full chorus to attract mates. This natural phenomenon can be witnessed (and heard of course!) 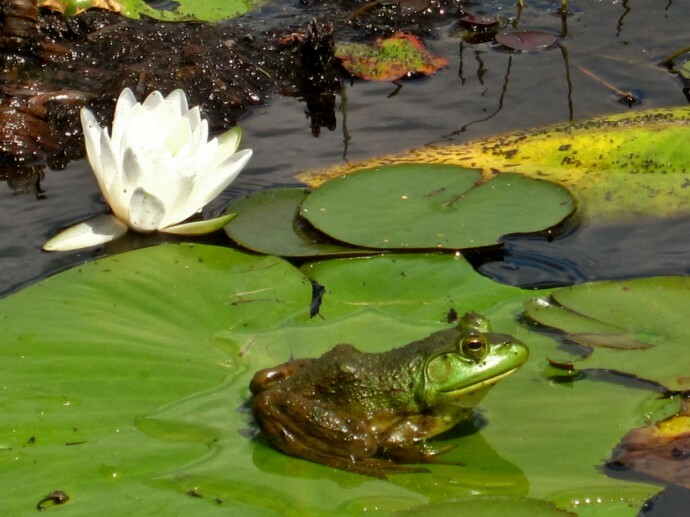 when you join in the fun at one of Mountsberg’s annual Frog Watcher’s Hikes coming up on Friday, April 24 and Saturday, April 25. Both hikes are from 6:30 to 8:30 p.m.
Join us for a fun puppet show, visit to the pond and even a ‘Swamp Tromp’ where we will search for reptiles and amphibians emerging from their winter dormancy! Frog songs or mating calls are so distinctive that various species can be identified just by their sound. Our experienced Outdoor Educators will show you how to distinguish between some of the most common species found in our region. Round out the evening with an up close and personal encounter with one of the park’s resident native Ontario snakes. The cost for the program is $16 for adults and $11 for seniors (age 65 years and over) and children (age 5 to 14 years), please note all applicable taxes are extra. Children 4 years and under are free. To register, please visit the events calendar on the Conservation Halton website, www.conservationhalton.ca/events, and click on the event listing. For more information on this event and all the other happenings at Conservation Halton Parks visit www.conservationhalton.ca/events; to find out about recreational programs and services, go to www.haltonparks.ca.